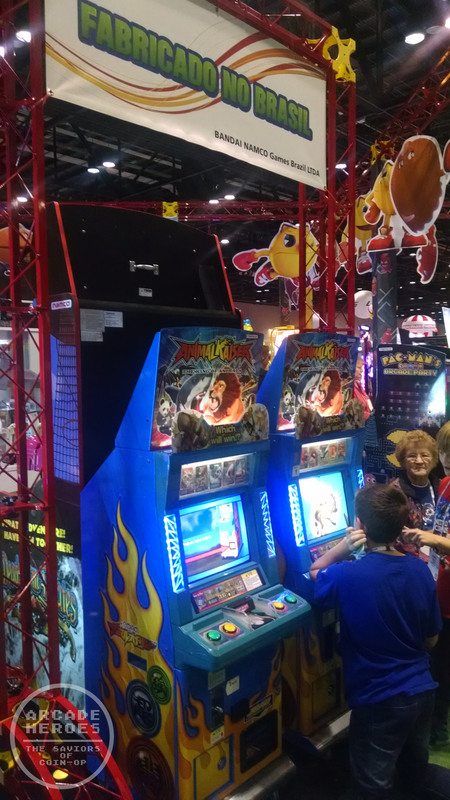 With this post I can finally breath a sigh of relief as it means that my IAAPA 2014 coverage is wrapped up. The amount of video to edit and comment on was significant this year and with so much media to sift through, it is easy for something to get lost. So here is your round up of everything I came across at the show and maybe a few things I happened to miss in the other posts. I know in hindsight there are a couple of booths I overlooked or couldn’t find while wandering the trade show floor, unfortunately that happens every time something this big takes place. Overall I thought it was a great event and likewise it was great meeting up with a number of people you only tend to see at such shows. 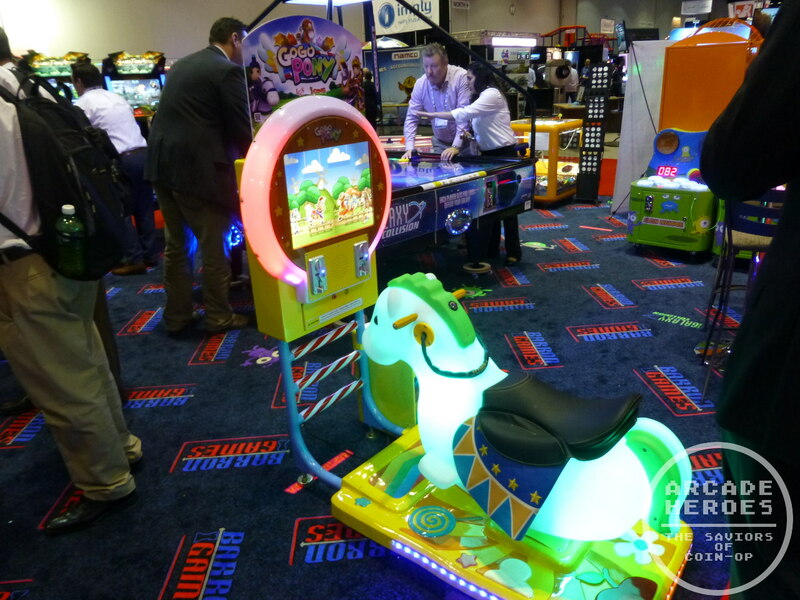 Much like the IAAPA Mega-Post from last year, this all points to the same trend as before – companies are still creating new games and products to support the Out-of-Home Entertainment industry. Even if that doesn’t mean for a traditional video arcade, there are still many businesses out there which use arcade games as a way to entertain their guests and generate some extra income. There is a trend towards bigger ticket items but there are still smaller/cheaper options to find if you look. I am going to split this up into tabbed categories and either way it is a media heavy post. So if you are on a slow connection, my apologies in advance as this is going to take some time to load. All games will be sorted alphabetically by name. Let’s start with our specialty here at Arcade Heroes, video arcade games. Counting these, here are 26 games which are coming soon or are available to purchase already. Some of the videmption games can work as a video only thing and they would beef that roster up along with the games in the ‘other’ category. Out-of-home entertainment is on solid ground if we just make a judgement on this particular trade show. Aliens Armageddon (Play Mechanix/Raw Thrills) – Rescue the remaining humans found on Earth as the Aliens (from the Fox franchise) overrun the planet. Light-gun shooter for 1-2 players; two cabinet designs. Available now. Allied Tank Attack (InJoy Motion) – Tank battle game with 3 game modes and a motion seat. Two models exist (single seat and dual player seat) and these can link up. While released last year, it has received several upgrades to the hardware and software. Available now. Armed Resistance (Universal Space) – This is an arena team combat game that is unique to the current arcade scene which rarely is attempted by developers anymore. Supports 16 linked units. Coming soon. Big Buck HD (Play Mechanix/Raw Thrills) – Test your virtual hunting skills in this popular light-gun game for 1-2 players. New DLC featuring new animals and a zombie mode is coming soon. Standard game available now. Dead Heat Riders (Bandai Namco Amusements) – Ride through the streets of 4 different cities on a motorbike. Available now. Dirty Drivin’ (Specular Interactive / Raw Thrills) – Fast action, vehicular combat game with 14 different tracks and various trucks. This recently re-entered into production. Flashlight of the Evil (Sealy Game) – Horror themed light-gun game that has various features (stereoscopic 3D, wind blower, foot pedal, ticket option)but what I played at the show had a couple of issues. With those worked out it could be pretty fun. Available now. GoGo Pony (IGS/Barron Games) – Video ride for kids where you ride a pony. Available now. Jurassic Park (Raw Thrills) – Return to Jurassic Park before the movies do so next Summer. This marks Raw Thrills’ first step into the world of theater cabinet and motion seat gaming; light-gun shooter for 1-2 players. Coming in February 2015. Lost Land Adventure (Bandai Namco Amusements) – Taking some of the Deadstorm Pirates concepts and giving them a new game with a focus on treasure collecting and a huge dome screen. Available now. Mario Kart Arcade GP DX (Bandai Namco Amusements) – the ever popular Mario Kart is back in the arcade and now sporting online updates. Available now. Monster Eye (IGS/Wahlap) – SImilar to other co-op shooters, battle monsters invading some modern cities, working together to take them out. Features a motion seat and a Kinect sensor. Available now. NEON FM (Unit-E Technologies) – The production version of this new hand-controlled rhythm game is sporting new multiplayer and smartphone login features. Available now. Overtake (IGS/Wahlap) – New driving game that is similar in several ways to the FnF arcade games using a casual approach to the concept. Available now. Power Truck Special (IGS/Wahlap) – A slight upgrade to the Power Truck game that was released in 2011. Refer to the video directly above this entry for a look. Project X-Pher 4D (InJoy Motion) – A sci-fi co-op light-gun shooter that has been out for a little while now, but seen in the Theater cabinet with a motion seat. Available now. Pump It Up PRIME 2015 (Andamiro) – The newest entry for the foot controlled dancing series, now sporting online features and a few other extras. Available now. Redline Rampage: Gas Guzzlers (GlobalVR) – The newest driver from GlobalVR has a Twisted Metal vibe to it (not Mario Kart like I mention in the video). Stay tuned for secret codes to unlock tracks and cars here on Arcade Heroes. Available now in both dedicated and kit forms. SharpShooter (Zeroplus / Coastal Amusements) – Accuracy testing/shooting gallery type video game. 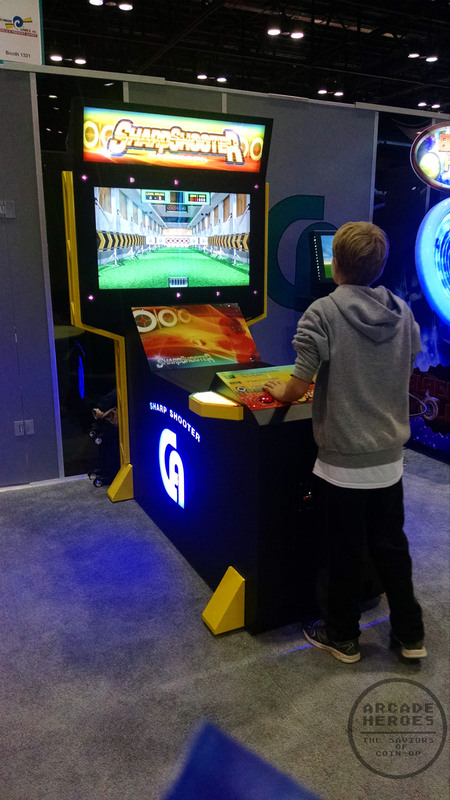 At IAAPA it was in a completely different cabinet than seen previously but the software is the same. Available now. Showdown (Sega Amusements) – The newest driver from Sega was shown in force at the Sega Amusements booth with a curved screen, motion seat Super Deluxe version and a standard version. Demolition derby style action in the arcade. Coming Jan 2015(standard) / Feb 2015 (special). Snocross X Games (Raw Thrills) – The blend of snowmobile and motorbike style racing into one game where you can throw snowballs and feel the wind in your face. Available now. Star Wars Battle Pod (Bandai Namco Amusements) – The triumphant return of Star Wars to the arcade will take place months before the hoped-to-be-triumphant return of the franchise to the silver screen. I kept meaning to get my picture taken with Darth Vader and the Stormtroopers they had standing in front of the cabinets but I kept forgetting until it was too late. The release on this was pushed back to March 2015. Storm Racer G (Wahlap / Sega Amusements) – Race across various locations in China in this Ridge Racer style game. Available now. Super Alpine Racer (Raw Thrills/Bandai Namco Amusements) – Go skiing without the risks in this modern return to Namco’s classic. Available now. Teratoma: The Last Rebellion (Wahlap) – This is a sci-fi co-op shooter where you fight against crazy mechanical and mutant enemies. Available now. Transformers: Human Alliance (Sega Amusements) – Fight with the Transformers in this popular co-op light-gun shooter. 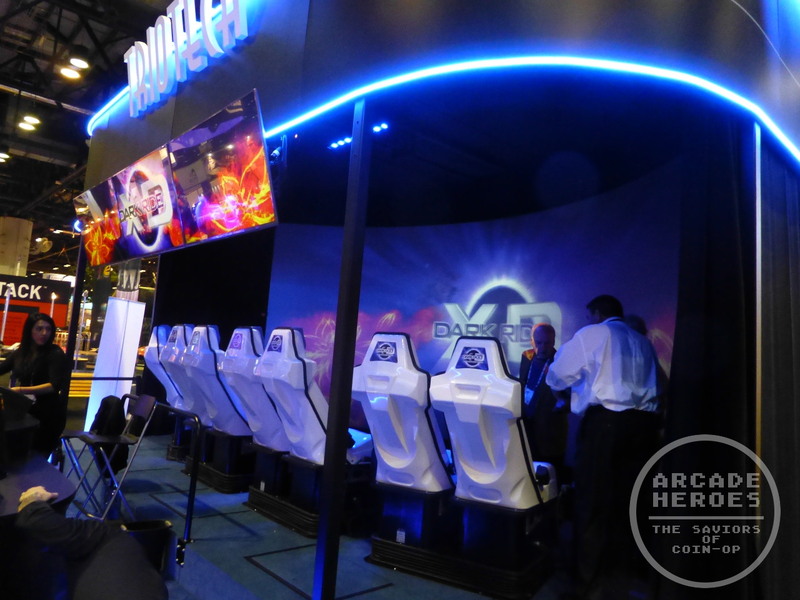 Available now; Sega did show off a huge 80″ version at IAAPA. While I wasn’t expecting any, 1-on-1 fighting games were absent from the show, even among the Chinese developers who sometimes bring such games over. So even with the impending Tekken 7 and Pokken Tournament in Japan, that doesn’t seemed to have moved the needle among manufacturers in the West. 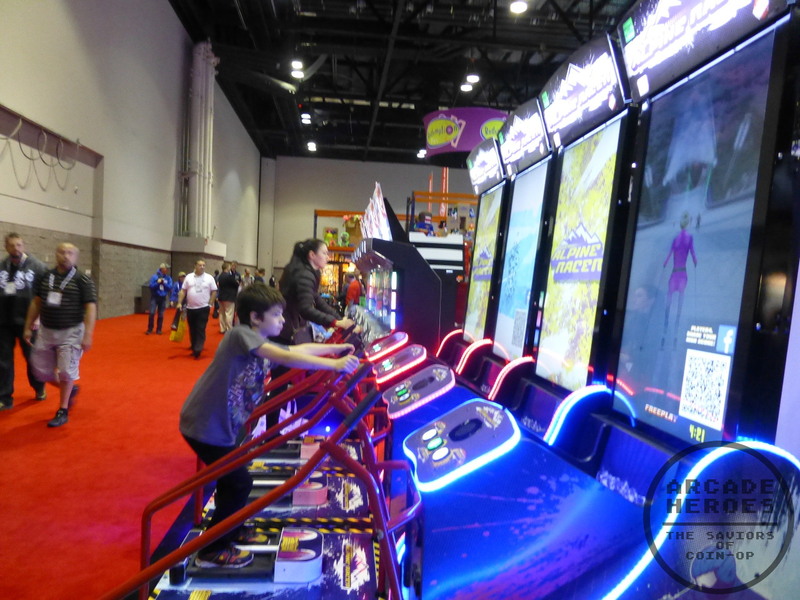 Videmption games are a class of game that blends video arcade gaming and ticket redemption into one. 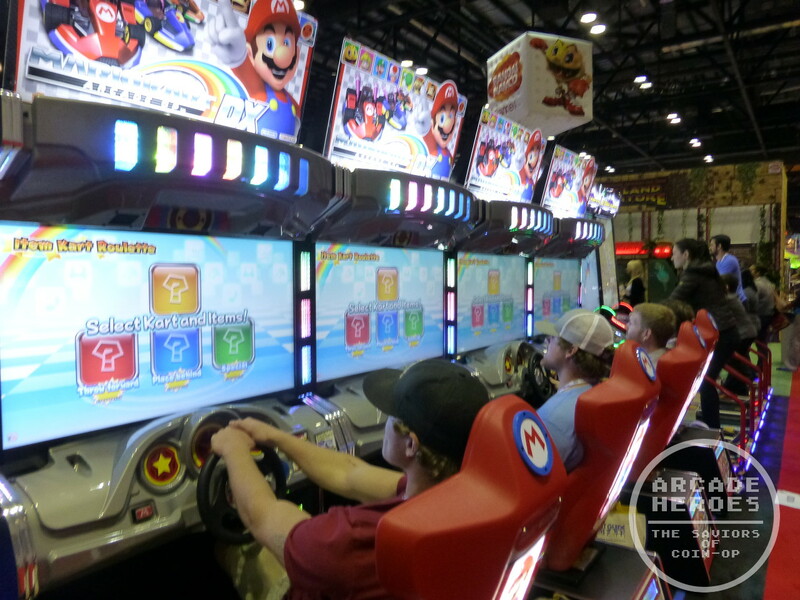 Sometimes arcades are given the ticket option as an afterthought while others it is a primary focus of the game design. Animal Kaiser (Bandai Namco Amusements) – This game has been around for a while, often classified as “kid vending” machines as they vend collectible cards to kids but there is a video game they can play using the cards. The sign above this is in Portuguese and says “Made In Brazil”. Available now. Candy Crush Saga (Adrenaline Amusements) – One of the most popular puzzle games found in social media today, Candy Crush Saga finally makes the jump to the arcade. Two cabinet designs: Standard w/ 42″ touchscreen & prize merchandiser with a transparent multitouch display. Available now. 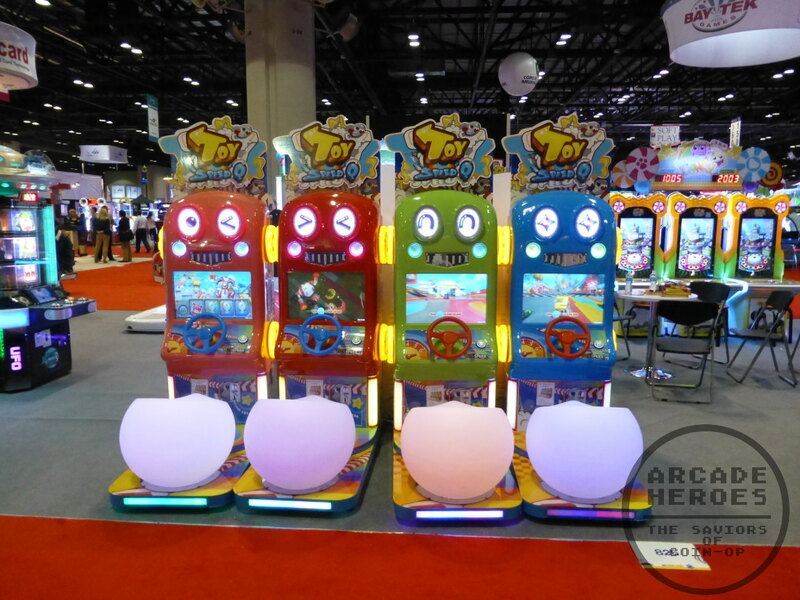 Fishbowl Frenzy (Teamplay Inc.) – While not based upon a license, the technology used in this game led to it winning an IAAPA Brass Ring Award and the company seeing more pre-orders for it than any of their games in recent history. Available now. Flappy Bird (Baytek Games) – The worldwide phenomenon comes to the arcade now supporting a larger screen and support for winning tickets. Available now. 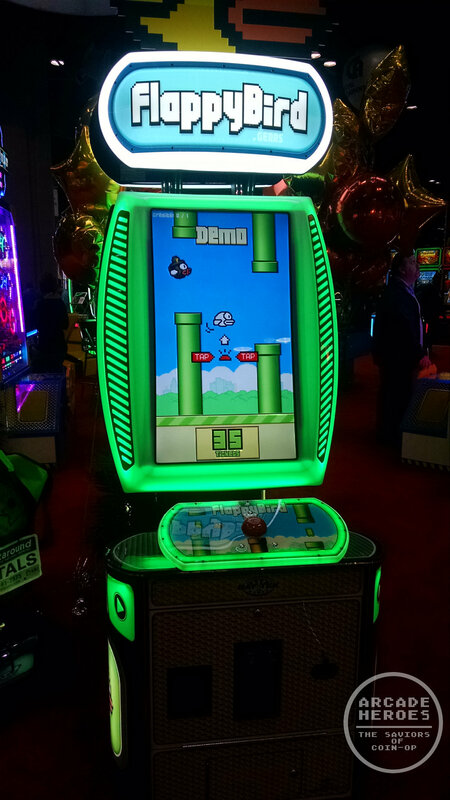 Flying Tickets (Adrenaline Amusements) – Similar to Flappy Bird, this has a huge 60″ screen and supports two players simultaneously. Available now. HopStar (Baytek Games) – Using the large pad in front of the game, players see how far they can correctly play hopscotch. Coming Soon. Kiddy Dido (InJoy Motion) – Designed for 2-8 year old kids, this is a variation of the Dido Kart arcade game but all the child has to do is steer to win music notes and tickets. Available Now. Kung Fu Panda Dojo Mojo (Play Mechanix/ICE Games) – The popular franchise finds a unique way to hit the video game scene thanks to arcade hardware. Available now. LoonyTix (Incredible Technologies) – Seen at Amusement Expo, this is like a virtual ticket blower/grabber. “Grab” the tickets that swirl around on the screen before the time is up. Available now. Mini Motor Racing Arcade (Tecnoplay / Benchmark Games) – We mentioned this game on the blog earlier this year, it is very much like a modern Super Sprint. Benchmark was gauging operator interest in this at the show, unsure if that was enough for them to sell it here or not but I imagine we will know soon. This is available in Europe now although more as a straight video game and not the videmption version. 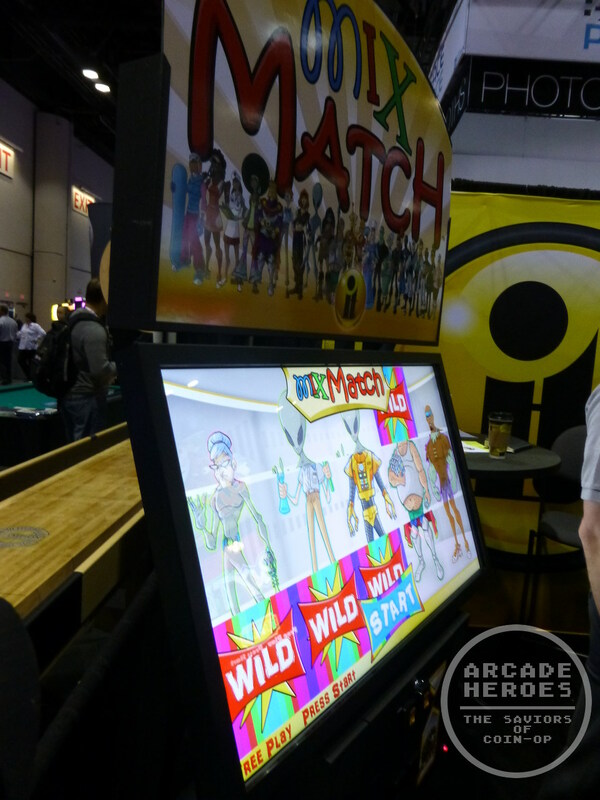 MixMatch (Incredible Technologies) – Using the same cabinet as LoonyTix, this is a different game concept, which is a matching game mixed with a dress up game. Piano Tiles (Baytek Games) – Unique game that is very simple in play and graphics, “play” the piano for tickets. Coming Soon. Pinata (LAI Games) – Unique virtual pinata bashing at the arcade for candy or tickets. Available now. 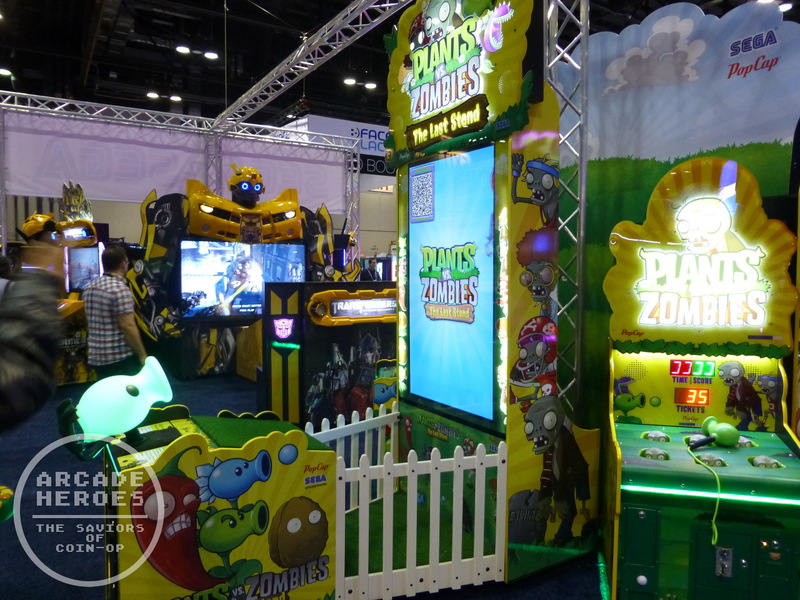 Plants Vs. Zombies: The Last Stand (Sega Amusements) – Stop the zombies before they reach your house in this light-gun game. 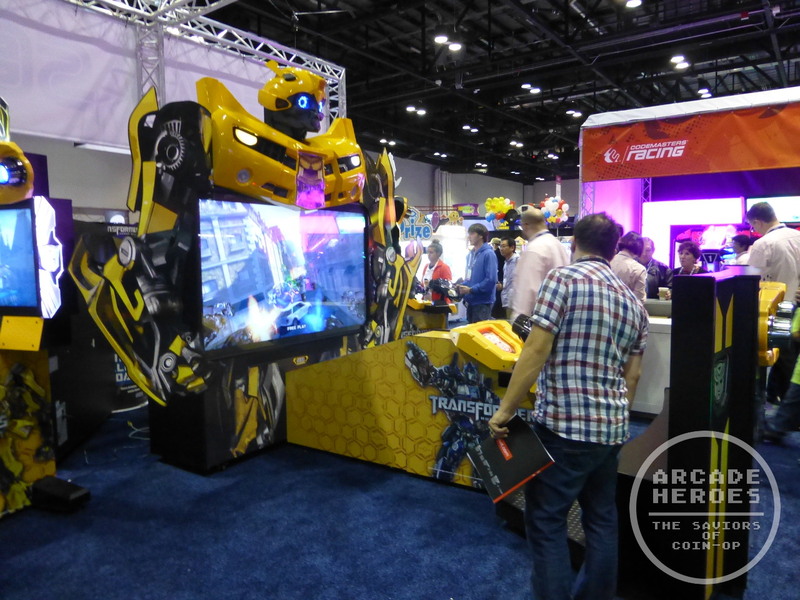 A new 60″ screen version was at IAAPA(pictured below with the huge Transformers cab). Available now. Safari Ranger (Universal Space) – Capture the animals running across the safari using a lasso/spinner controller. Cabinet designs differ on supporting 1-4 players. Available now. Surfer Bikes (Universal Space) – Put the pedal to the medal with this bike racing game (with an actual bike pedal style controller) for kids. Available now. Subway Surfers (Coastal Amusements) – The popular endless runner from the mobile space invades the arcade with a larger screen and a joystick controller. Available now. Shooting Mania (LAI Games or Wahlap) – Multiplayer game where you try and blast the toys hanging from different threads/chains. Available now. 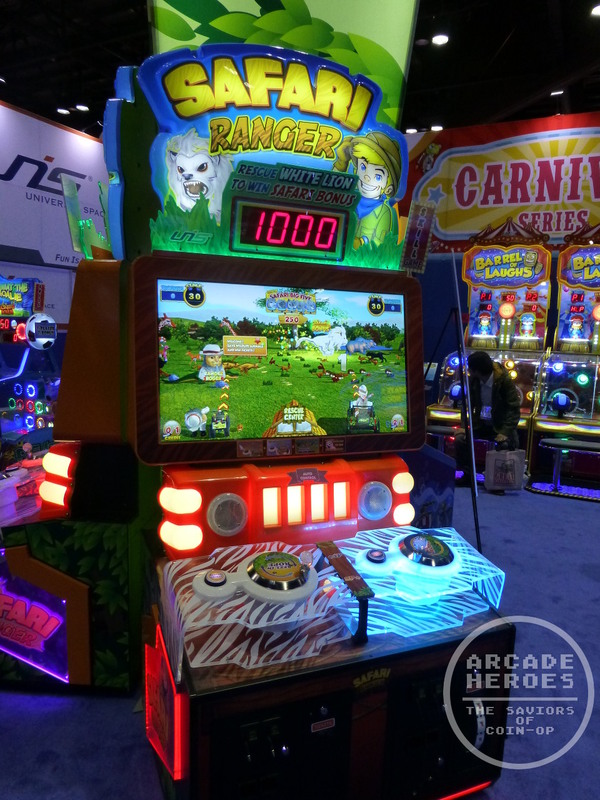 Temple Run 2 Arcade (Coastal Amusements) – I could almost repeat the same line used for Subway Surfers but this one has a slightly different cabinet design and a trackball controller. Available now. Toy Speed (Sealy Game) – Kids racing game with no foot pedals. Interesting and colorful on the cabinet, great frame rate on the graphics. Available now. Treasure Hunt (Universal Space) – While conceptually it is another endless runner game, this one changed it up on the control by using a Kinect sensor. Available now. Yahtzee (Coastal Amusements) – The popular home game comes to the redemptioncade. I did not grab a photo of this at the show so I am using a stock photo. You pop the 5 balls with dice in them and try to get the combos as laid out by the Yahtzee rules. Available now. Here are the other items that fit into different categories such as pinball or motion rides and simulators. Medieval Madness Pinball Remake (Planetary Pinball / Chicago Gaming / Stern) – One of the most popular pinball games of all time returns using some modern tech while keeping the same feel as the original. Available this month. Simulators by CXC Simulations and Cruden – I combined these two into one video, professional grade simulators by different companies. 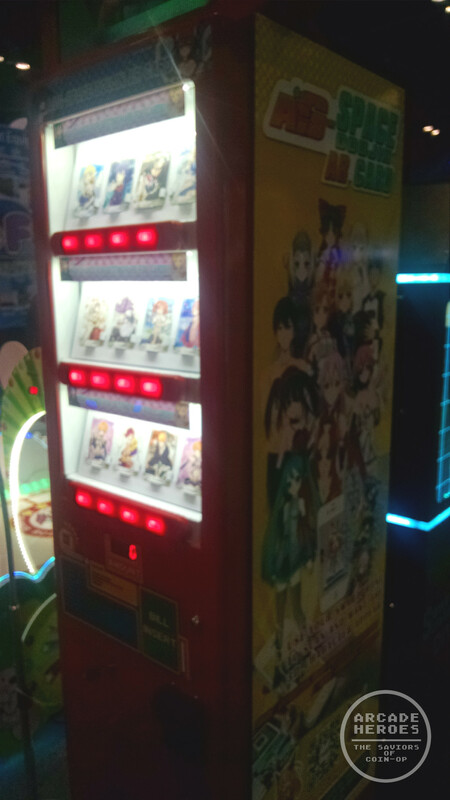 Space Doujin AR Card Vendor (Ocean) – A Chinese booth had this oddity, an Augmented Reality card vending machine that was tailored towards selling ‘doujin’ cards with scantily clad anime girls that could be scanned in with a QR scanner to appear on your phone. The Hobbit Pinball – Middle Earth is back on the pinball scene based upon the latest Peter Jackson films. Available January 2015. The Walking Dead Pinball Pro (Stern Pinball) – From the hot TV series comes this zombie bashing pinball fest. Available now. 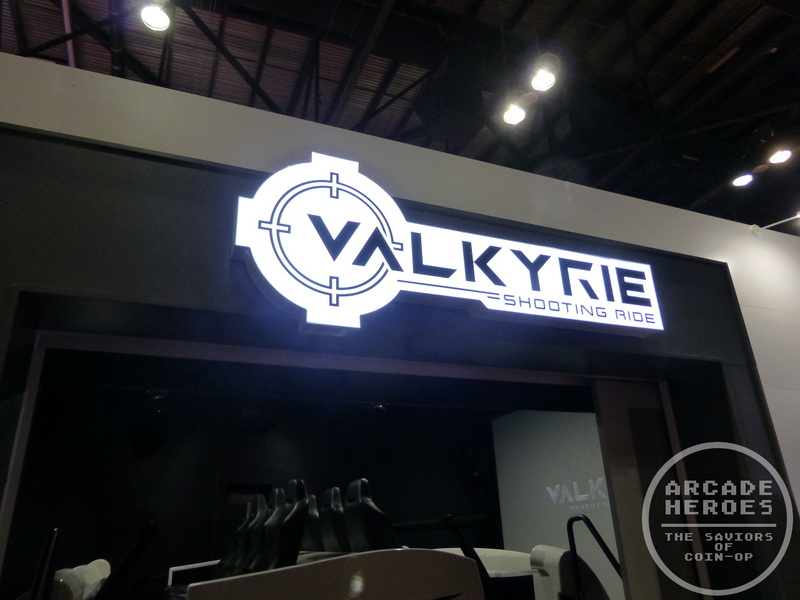 Valkyrie Shooting Ride (Specular Interactive / Simuline) – Simulines newest motion theater concept goes interactive with 8 guns, 4 players facing two opposite screens. Software featured was the Project HADES zombie shooter. Coming March 2015. Wizard Duel (Scare Factory) – A head-to-head animatronic battle game. 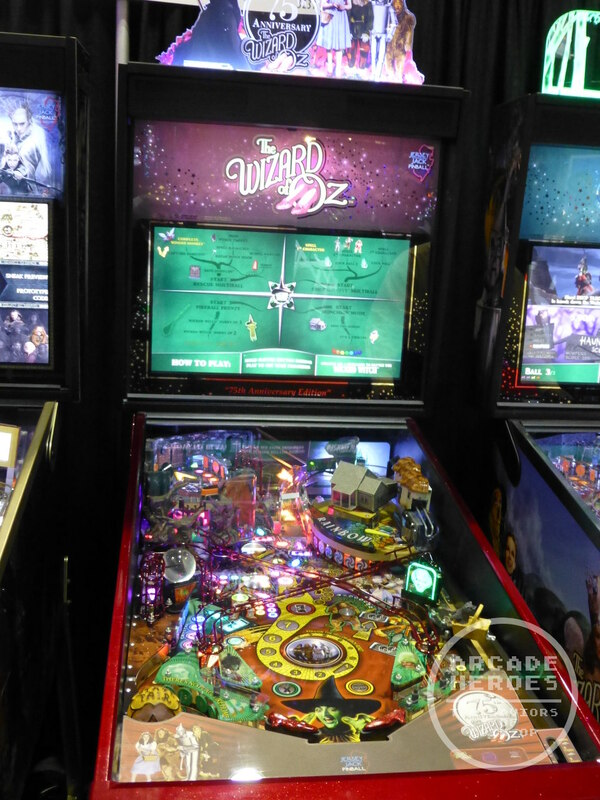 Wizard of Oz 75th Anniversary Edition Pinball (Jersey Jack Pinball) – A special collectors version of the WOZ concept by JJP with higher quality toys and some new art. Available now. XD Dark Ride (TrioTech) – TrioTech’s interactive light-gun based multiplayer theater which currently supports six “films” although I think of them more as games in this instance. The setup at the show had 8 seats but they can support a higher or lower amount on that. Available now. If you’ve scrolled through all of the tabs, then thanks for checking it all out! Tell your friends, the arcade lives!